1. A work in which the characters and events are to be understood as representing other things and symbolically expressing a deeper, often spiritual, moral, or political meaning. 2. The symbolic expression of a deeper meaning through a story or scene acted out by human, animal, or mythical characters: George Orwell's Animal Farm novel is an allegory in which animals behave and talk like humans.". 3. A symbolic representation of something. 4. A story in which people, things, and happenings have a hidden or symbolic meanings. 5. Etymology: a description of one thing under the image of another; from allos,, "other" plus agoreuein, "to speak openly in an assembly" from agora, "marketplace, place of assembly". The insertion or addition of a foreign substance, or elements, into the body. 1. A substance that is foreign to the body and can cause negative reactions in certain people: Examples of allergens include, pollen, dust mite excretion, dander or house dust, mold, and ragweed pollen which can cause hay fever. When seeking medical care, the physician needs to know whether the symptoms vary according to the time of day, or the season of the year, and whether there are any pets or other possible sources of allergens in the home. 2. Etymology: from Greek allos, "different, strange" + ergon, "action". 1. 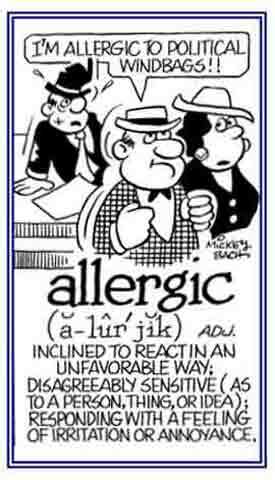 Relating to an abnormal or disabling sensitivity to certain agents: Some people are allergic to certain drugs, food, pollen, etc., resulting in a hypersensitive reaction when they are exposed to them. 2. 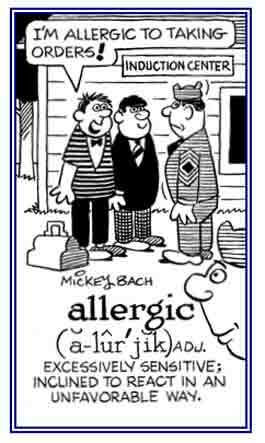 Pertaining to a dislike of or a resistance to do certain things: Earl is an allergic person because he is required to get up and go to work five days a week. © ALL rights are reserved. A medical practitioner who specializes in the diagnosis and treatment of reactions to certain substances or materials that are hypersensitive to people and cause illnesses: The allergist conducts medical tests to diagnose which agents cause the patient to be have a rash or other illness. When the allegist identifies the agent or agents that cause the ailment, he or she will recommend ways to avoid further exposure or put the patient on a regimen of medication to control the negative reactions to his or her health. 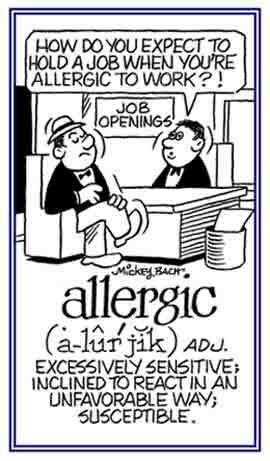 The study of the causes and nonsurgical treatments of allergies. 1. A negative reaction to foreign substances by the immune system and the body system of defense against foreign invaders, particularly pathogens (the agents of infection): When Mary was in the room with a cat for a few minutes, her allergy became apparent as she started to sneeze over and over again. The substances that trigger allergies include pollens, dust mite, molds, danders, and even certain foods. Although allergies can develop at any age, the risk of developing them is often genetic or is related to one's family history. Hay fever is the most common of the allergies and refers to seasonal nasal symptoms that are caused by pollens and year round or perennial rhinitis is usually due to indoor elements; such as, dust mites or molds. Symptoms of allergies result from the inflammation of the tissues that line the inside of the nose (mucus lining or membranes) after the causes of allergies are inhaled, and adjacent areas, such as the ears, sinuses, and throat can also be involved. A condition in which a sensation; such as, of pain or even a slight touch, is experienced at a point away from where the stimulus occurs: Allesthesia is the inability to tell which side of the body has been touched and if one extremity is stimulated, the sensation is felt on the opposite side. A reference to the sensation of a stimulus in one limb which is referred to the contralateral (opposite) limb: Raymond was confused by the allesthetic pain that occurred in his right foot when it was his left shoe that was too tight and pinching his foot. An antigen existing in alternative (allelic) forms in a species; therefore, inducing an immune response when one form is transferred to members of the species who lack it; typical alloantigens are the blood group antigens. The allelic is an alternative form of a gene. One of the different forms of a gene that can exist at a single locus (spot on a chromosome). Also one of the different forms of any segment of a chromosome. A serum that contains alloantibodies. The surgical removal of part of a structure or bodily organ or the surgical reconstruction or replacement of a malformed or degenerated joint with another part: Dr. Watts, the orthopedic surgeon, explained the alloarthroplasty process to Mr. Jason, explaining that the replacement of his painful bone links were in fact a standard operation. 1. A form of a chemical element having an atomic weight different from that of the naturally occurring form. 2. An isotope with a different atomic weight than the naturally occurring form of the same element. Showing page 1 out of 12 pages of 173 main-word entries or main-word-entry groups.